Strolling past our empty luggage, sitting neglected in our closets stirs up a vast array of emotions in our family. There are times when we become excited at the thought of preparing for our next big adventure, eager to get packed up heading out the door. Sometimes, we feel reflective as we think back to our last opportunity to see the great big world. Other times, we feel anxious about the uncertainty of when and where we will dash off to next. Our many stages of wanderlust. Many people within the special needs community view travel from a different perspective. 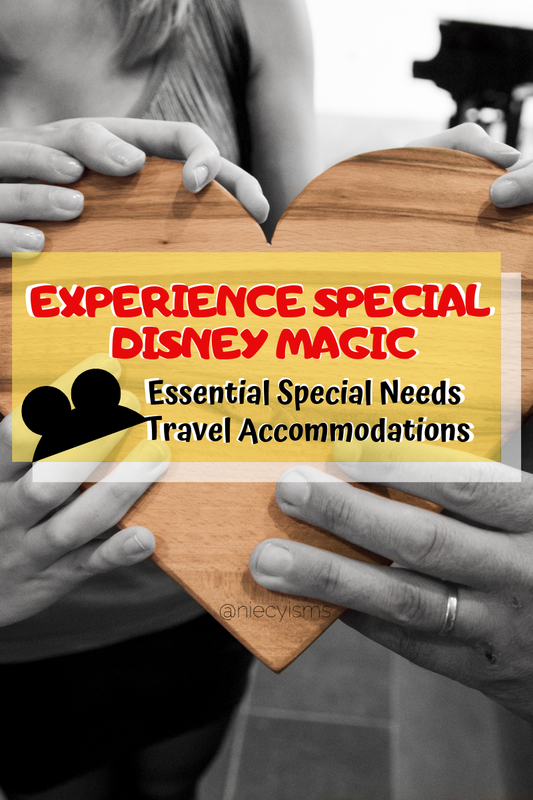 Challenged with a unique set of circumstances, special needs families and individuals desire locations and attractions offering diversity in accommodations. Disney strives to meet these special needs, "As part of our unwavering commitment to accessibility, there are a variety of services and facilities to accommodate Guests with mobility, hearing, visual and cognitive disabilities." Thank you to EZ Dis by Instant Impressions Travel Services for the courtesy of sponsoring this post with promotional product for editorial content purposes as a Brand Ambassador. Changing routines and unfamiliar environments when traveling with a special needs child or adult presents a complex set of circumstances for the individuals, as well as their caregivers or companions. Searching for convenient accommodations with essential amenities require detailed consideration and research. Offering diverse Disney vacations with acclaimed guest services delivered with the highest attention to detail, trust the experienced Disney Destinations Specialists at EZ Dis by Instant Impressions Travel Services for a memorable experience. Disney provides an accommodating environment for guests to enjoy the services, facilities, and accessible experiences. Offering guests services including wheelchair access vehicles, the Disability Access Service card, and Handheld Captioning available throughout the theme parks and hotels at Walt Disney World Resort and the Disneyland Resort, on every Disney Cruise Line ship and Disney's private island paradise, Castaway Cay. Pro Tip - Disneyland Guest Relations locations in the park are a valuable resource for learning more about the services offered to Guests with disabilities. - The Disneyland Park Guide for Guests with Disabilities and Disney California Adventure Park Guide for Guests with Disabilities provide useful information for Guests with mobility, visual and hearing disabilities at each theme park. - The Guide for Guests with Cognitive Disabilities outlines planning tips as well as services and accommodations throughout Disneyland Resort. - Attraction Details for Guests with Cognitive Disabilities describes the types of experiences Guests will encounter on each of the theme park attractions (noise, darkness, etc.). - Disability Access Service describes how Disneyland Resort accommodates Guests with disabilities and their parties at attractions and entertainment. Plan your next Disney vacation with EZ Dis by Instant Impressions Travel Services for packages including FREE exclusive souvenir lanyards and trading pins. Their agency has a unique professional relationship with Disney's Special Events departments to coordinate memorable, magical experiences for your family and friends. Contact EZ Dis by Instant Impressions Travel Services today (mention affiliate code NAN18) and "Let the Magic Begin"!